Would you like to play with your favorite characters? Then start it right now and launch this guy. You will use mouse to control him and collect as much money as possible and enjoy this funny game. Help this guy and set the best record. In this cool game Muscle Man wishes he could fly, so Racki the Wishmaker grants his wish with a giant pumpkin catapult! 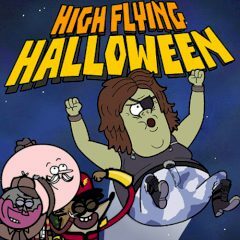 That is why, now it's up to you to help Muscle Man ascend to the stratosphere without running into any creepy Halloween monsters. This time you are going to collect coins to buy radical power-ups and boosts from Muscle Man's buddies, like High Five Ghost, Mordecai, Rigby, Skips, Pops and Benson. Well, see how high you can fly! Use the mouse to control and have fun. You will love this game, have no doubt.